Combine coriander and cumin; press evenly onto beef steaks. Place steaks in center of grid over medium, ash-covered coals; arrange watermelon slices around steak. Grill steaks, covered, 11 to 15 minutes (over medium heat on preheated gas grill, 13 to 16 minutes) for medium rare (145F) to medium (160F) doneness, turning occasionally. Grill watermelon 2 to 4 minutes or until grill marks form, turning once. Carve steaks into slices. Cut each watermelon slice into 6 wedges. Season beef and watermelon with salt and pepper, as desired. Combine arugula and dressing in large bowl; toss to coat. Divide arugula among four serving plates. 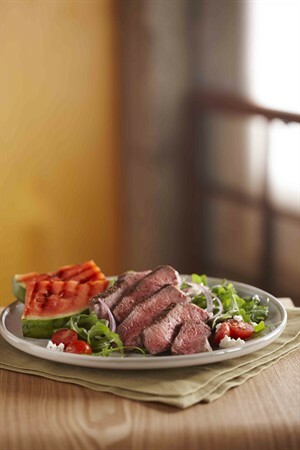 Arrange beef and watermelon on salad; top evenly with tomatoes, onion and cheese.